Much of the current debate regarding digital diplomacy tends to focus on the question of evolution vs. revolution. The focal question of this debate is does digital diplomacy represent a revolutionary way of conducting diplomacy or is it merely an evolution in the practice of diplomacy. While answering this question is well beyond the scope of one blog post, this week I attempted to evaluate the manner in which foreign ministries used social media in order to offer consular assistance to citizens stranded in Nepal following the recent earthquake. This analysis explores the manner in which MFAs use social media in order to achieve a traditional goal of public diplomacy- aid to citizens in need. As such, it may be an example of the evolutionary view of digital diplomacy. The earthquake that hit Nepal on April 25th has left much devastation in its wake. In addition to the destruction of buildings and infrastructure, it is estimated that more than 8,000 people were killed and more than 19,000 people were seriously injured by the quake. As much of Nepal lay in ruins, foreign ministries throughout the world attempted to make contact with their citizens caught in the quake’s aftermath. Interestingly, most foreign ministries used digital diplomacy as part of their response to the earthquake thereby demonstrating the manner in which MFA now use social media in times of crisis. Specifically, the use of twitter following the quake demonstrated how consular assistance is offered to citiznes the in 21st century. 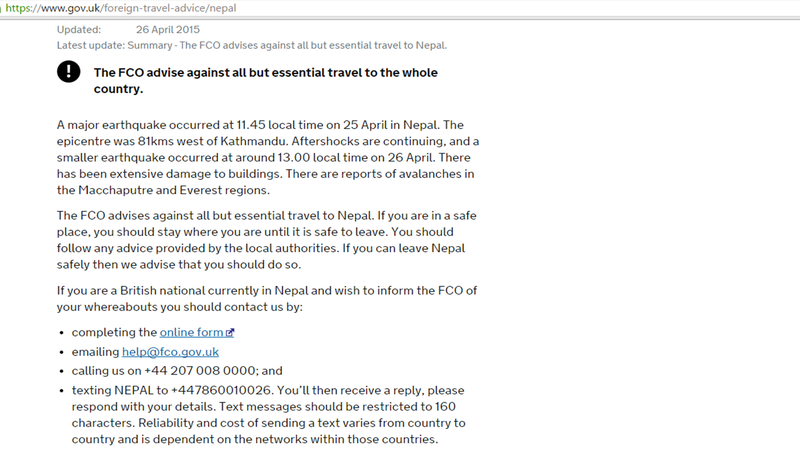 Within hours of the Nepal earthquake, the UK foreign office had already launched a website offering information to British citizens including the manner in which one could make contact with the MFA be it through an online form, an email and even text messages. 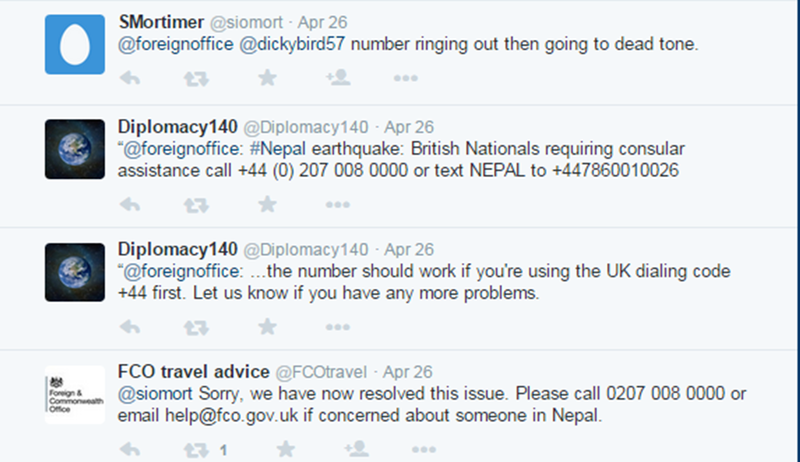 In addition, the foreign office published such details on its official twitter channel while using the hashtag #Nepal. 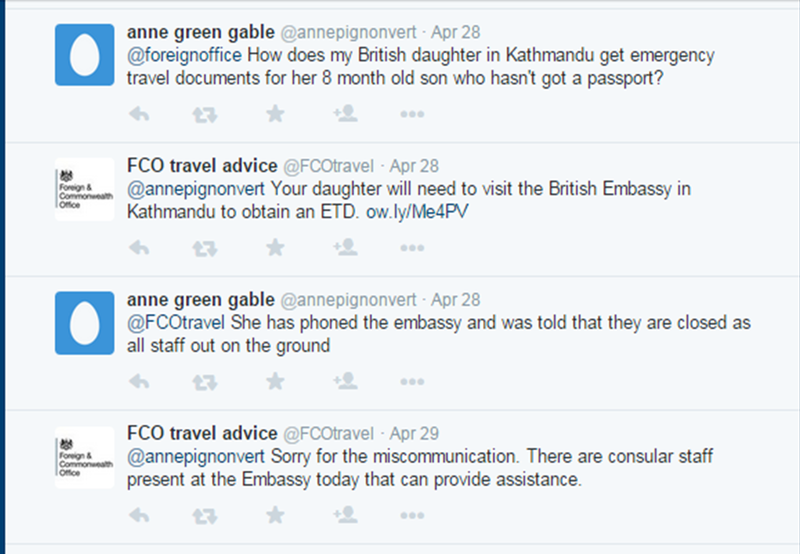 When a British citizen looking to her daughter and grandchild in Nepal contacted the Foreign Office via twitter she was immediately offered assistance as seen in the dialogue below. When another British national tweeted that the Foreign Office helpline was disconnected, the MFA immediately responded indicating that the problem had been resolved. It appears that the UK Foreign Office used twitter to both disseminate information and to communicate directly with its citizenry. This use of twitter demonstrates a dialogic form of communication between an MFA and its followers as opposed to a broadcast model of public diplomacy characterized by a one directional flow of information. Moreover, given its immediate use of twitter, the Foreign Office must have assumed that British citizens in need of aid would visit its social media accounts. Thus, the Foreign Office twitter profile has become more than platform of issuing press releases, it is now a vital communication tool in timea of crises. Like the Foreign Office, the US State Department also took too twitter soon after news of the quake broke offering citizens emergency information. In addition, the State Department opened an emergency Email box through which people could provide information on relatives missing or in need of assistance in Nepal. Tweets published by the State Department also included links to a specific website while using the hashtags #NepalQuake and #NepalEarthqauke which were already dominating the twitterverse. By utilizing hashtags that were already trending on twitter, the US State Department exponentially increased the number of US citizens it could reach. 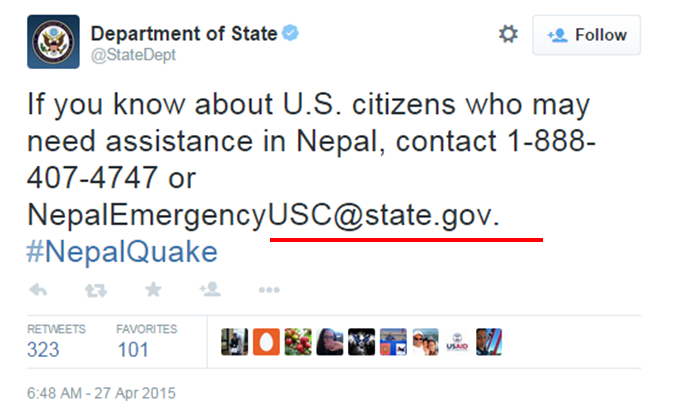 Likewise, by designating a specific email address to all Nepal related queries the State Department may have found an efficient way to gather information on all citizens in need of aid. It is fair to assume that in time of turmoil, citizens will attempt to communicate with their foreign ministry. As MFA’s operate several social media accounts across numerous platforms, the task of monitoring all these channels becomes a daunting one. Using a designated email accounts reduces such mayhem and frees up MFA resources. Canada’s foreign ministry made an interesting use of crowdsourcing in order to reach its citizens in need of consular or medical assistance. As seen in the tweet below, it asked all its followers to re-tweet the contact information it had published on twitter thereby potentially increasing the reach of these tweets. Canada’s DFATD also provided citizens with an emergency email address as well as relevant and updated information on flights leaving Nepal. Finally, Canada’s embassy in India urged followers to “check-in” and let their families know they are safe via Facebook’s Safety Check-In. Canada’s use of crowdsouricng is especially interesting as it enabled the DFATD to disseminate important information through a myriad of intersecting social networks thus reaching a greater number of citizens than those directly following Canada’s MFA on twitter. This may be a prime example of social networked diplomacy. In response to the quake, India’s MFA opened a special “control room” to gather information on citizens in need of aid. Moreover, this control room was soon given its own twitter handle- @MEAcontrolroom. Thus, social media followers could tweet directly at the MEA control room in order receive assistance as well as updated information. Soon after its establishment, the MEA control room began publishing information to its followers including the contorl rooms’ telephone numbers, email address and flights leaving Nepal. Interestingly, Indian officials also used their own twitter accounts in order to help Indian citizens. Such is the case in the tweet below in which Dr. Sumit Seth, an Indian diplomat, tweeted at a citizen that he would forward her plea for assistance to the MEA control room. The use of a designated twitter handle for the MEA control room demonstrates another operating model through which order is brought to chaotic situation. Like most MFAs, India’s MEA has numerous social media accounts. By designating one account to the Nepal quake, it was able to gather all relevant information from its citizens in Nepal without having to sort through hundreds of tweets posted by citizens on its many social media accounts. Moreover, the control room twitter handle may have helped Indian citizens looking for updated information as they now knew that there was only one channel they needed to follow. When evaluating various MFAs’ response to the earthquake in Nepal it becomes apparent that offering consular assistance through digital diplomacy is now common practice. Moreover, there were certain similarities between the MFAs evaluated in this post. For instance, all four used twitter to disseminate information and all four designated email addresses to Nepal related queries. However, each MFA seems to have adopted a unique model when offering consular assistance in times of crises. The UK Foreign Office seems to be the most conversational on twitter responding to comments and questions published by its twitter followers. The US State Department continuously changed the hashtags it used in order to utilize the most trending hashtags at any given moment. The Canadian MFA relied on crowdsourcing to reach as many of its citizens as possible while India brought order to chaos by creating a special control room with its own email address, telephone number and, most importantly, its own twitter handle. Such difference may suggest that MFAs are still attempting to master the use of digital diplomacy in times of crises. Posted in Uncategorized and tagged Consular Assistance, Digital Diplomacy, foreign ministry, Foreign Office, Nepal, Nepal Earthquake, Public Diplomacy, State Department. Bookmark the permalink.